The 2012 Ford Focus took the center stage during the press preview of the 2010 LA Auto Show but once the new C-segment hatchback was formally unveiled in a myriad of different forms and the stage was whisked away, the main attraction of the Ford display was performance. Along the edges of the Ford portion of the West Hall at the LA Auto Show, there were small rooms emphasizing different vehicles. One offered a look at the customization fun behind the new Fiesta and another featured a broad spectrum of Ford branded goodies but for the two displays along the rear wall, the new 2012 Ford Mustang Boss 302 and SVT Raptor F150 SuperCrew drew the most attention. While most auto show displays feature cars sitting around, doing nothing – the Ford area offered a firsthand look at the performance capabilities of the new 2012 Boss 302 Mustang. 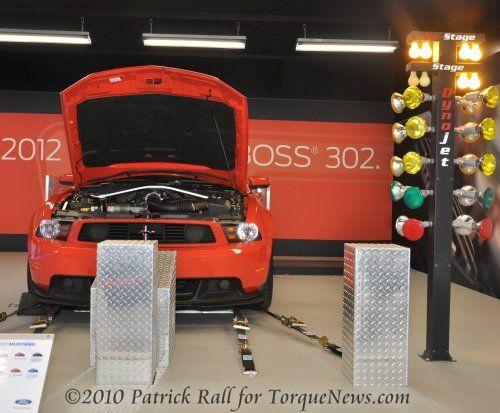 The bright orange Boss 302 was mounted on a rear wheel dynamometer with a drag strip “Christmas tree” in front of it and once an hour, a Ford test driver would fire up the new Boss and make a simulated quarter mile dragstrip pass. Click here for a video of the Boss 302 Mustang in action on the dyno – while it’s blurry, it provides a great chance to hear the new Boss make use of all 440 horsepower. After each run, the computer hooked to the test dyno would report the quarter mile time, with numbers in the 12.40 second range and trap speeds topping 115mph in stock form. Ford also had a black/red Boss 302 Laguna Seca edition on the floor in front of the dyno so spectators could get a good look at the track-built Boss. Next door to the Boss 302 display, the folks at Ford were showing off the new Ford SVT Raptor SuperCrew – powered by Ford’s new 6.2L V8 engine. This new Raptor offers more leg room for rear-riding passengers thanks to the increase cab size and the new 6.2L V8 adds almost 100 horsepower over the 2010 Raptor’s powered by the Triton 5.4L V8. To show off the undercarriage work to this purpose built offroad truck, there was a small stage that used hydraulics to lift the Raptor onto its side; exposing the underside of Ford’s high performance pickup. The Ford display was packed full of their other new models, ranging from the popular Ford Taurus to the 2011 Ford Explorer, which was cut in half to give show-goers a close up look at the architecture of the new sport ute. Ford also had plenty of help promoting the new Fiesta thanks to Ken Block’s #43 Fiesta gymkhana racer and the Focus models debuted the day before were scattered around the display. Click here to have a closer look at the 2010 LA Auto Show Ford gallery and stay tuned to TorqueNews.com for continuing coverage of the 2010 Los Angeles Auto Show.